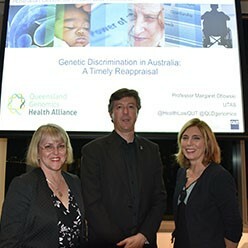 Professor Margaret Otlowski joined the Queensland Genomics Health Alliance and the Australian Centre for Health Law Research to deliver a public lecture on the risk of genetic discrimination in life insurance policies. Professor Otlowski is a Professor of Law and the Deputy Director of the Centre for Law and Genetics at the University of Tasmania. She was the Dean of the Law Faculty at the University of Tasmania from 2010 to 2017 and was appointed as the University’s Pro Vice-Chancellor (Culture and Wellbeing) in August 2017. Professor Belinda Bennett, Professor of Health Law and New Technologies at the QUT Faculty of Law, welcomed guests to the lecture alongside Mr David Bunker, Executive Director of the Queensland Genomics Health Alliance (QGHA). David spoke briefly about QGHA’s mission, objectives and the research programs it supports. 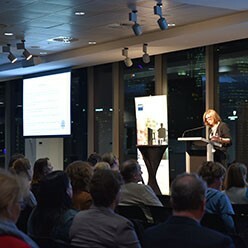 The lecture, ‘Genetic Discrimination in Australia: A Timely Reappraisal’ is part of a program of work funded by QGHA in which leading researchers at QUT, QIMR Berghofer Medical Research Institute, University of Queensland, and other institutions are working on the ethical, legal and social implications (ELSI) of genomics. In her lecture Professor Otlowski reviewed the recent Commonwealth Inquiry into the life insurance industry which recommended the introduction of a moratorium on the use of genetic information for underwriting in life insurance. She discussed evidence that the fear of genetic discrimination is inhibiting the uptake of genetic testing in clinical and research settings. Professor Otlowski argued in favour of implementing the inquiry’s recommendations in order to help reassure patients, their families, clinicians and researchers that genetic testing will not have a negative impact on future applications for life insurance. ‘Professor Otlowski’s lecture highlights the importance of considering the ethical and legal dimensions of genomic medicine,’ said Professor Bennett, QUT Faculty of Law. For further information about the QGHA, visit their website.